While we’re a few days closer to the holidays– and you’re probably expecting a sinfully decadent recipe– I’ve decided to shake things up a bit with this simple, wonderfully savory soup. This winter warmer is one of my family’s favorites. It’s modest, yet combines enough interesting flavors and textures to stand out. For starters, can we talk about how fabulous smoked paprika is?! I love the stuff. And paired with the cumin in this soup, you get a real flavor explosion. Add a little lime and cilantro, and you end up with a perfect, fresh complement to the spices. The other key ingredient is hominy. While I’ve been making this soup for a long time, I only recently switched from using the canned variety to dried hominy. You’ve seen in previous posts that I always advocate using dried, rather than canned beans. Well, I wondered if the same texture and flavor differences applied to hominy, so I had to give it a try. Wow! It really makes the soup that much better. Dried hominy added a more ‘tooth-some’ (am I making up words again?) quality to the soup. It’s firm (though not hard), and helps make the dish more substantial. I won’t be going back to buying the canned version. 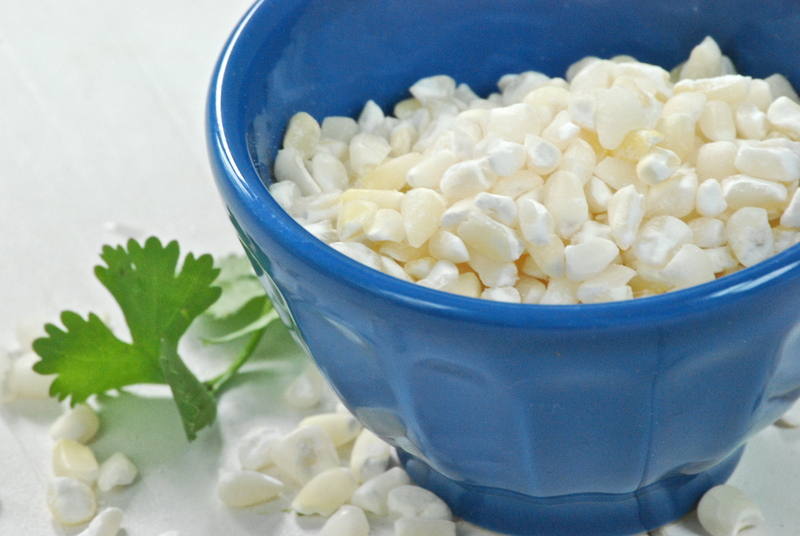 You may have to work to track down dried hominy. I eventually found it in a local Mexican foods market. The point is this– if you can find it, use it. 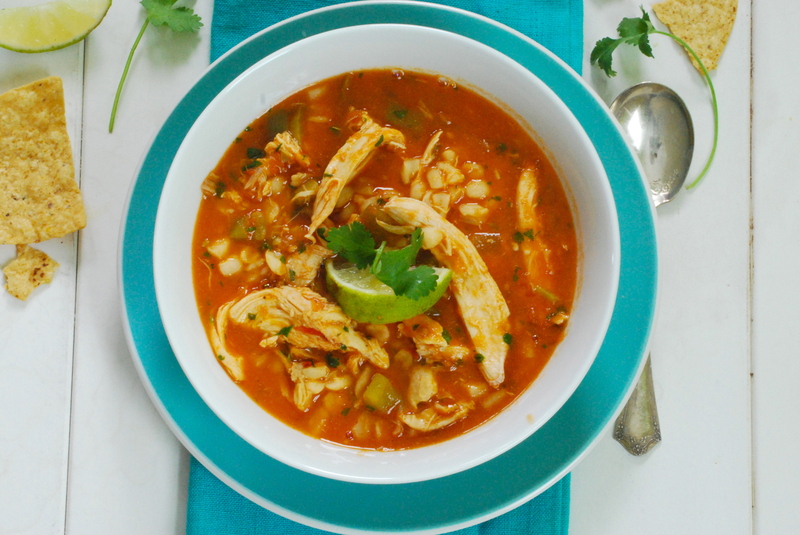 If not, the soup is still brilliant using canned hominy. If you go the canned route, use about 3-4 cans, drained. One thing to keep in mind, this soup will thicken more the day after it is made. The hominy continues to soak up liquid, so you may want to add more broth on the following days if you have leftovers. Make it– you’ll love it. And as for those sweet recipes, I have a few up my sleeve for next week. Have a great weekend! 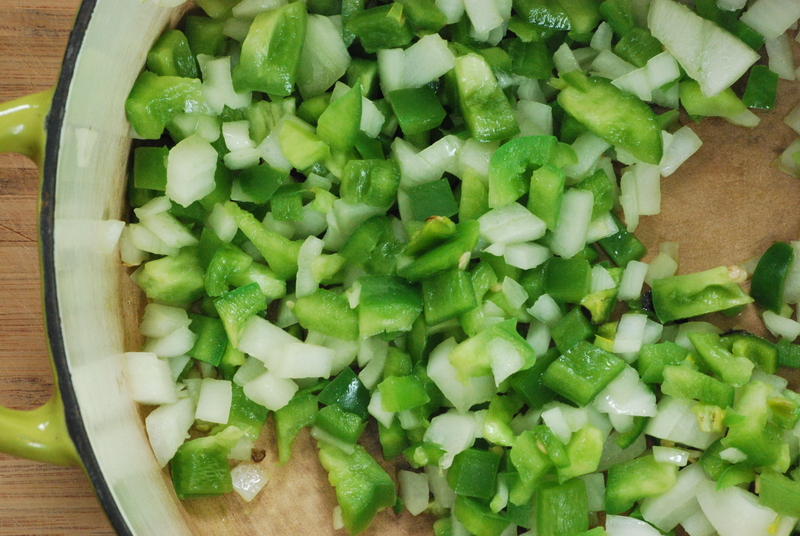 In a large Dutch oven over medium heat, sauté the green bell pepper, onion, garlic, and jalapeño in the olive oil until tender, about 4-5 minutes. Add the tomatoes, hominy, chicken broth, cumin, smoked paprika, salt and pepper. Bring to a boil and then reduce to a simmer. Cook until the hominy becomes tender, about 30-40 minutes. In the last 10 minutes of cooking time, add the roasted chicken. Doing so too early will cause the chicken to fall apart. 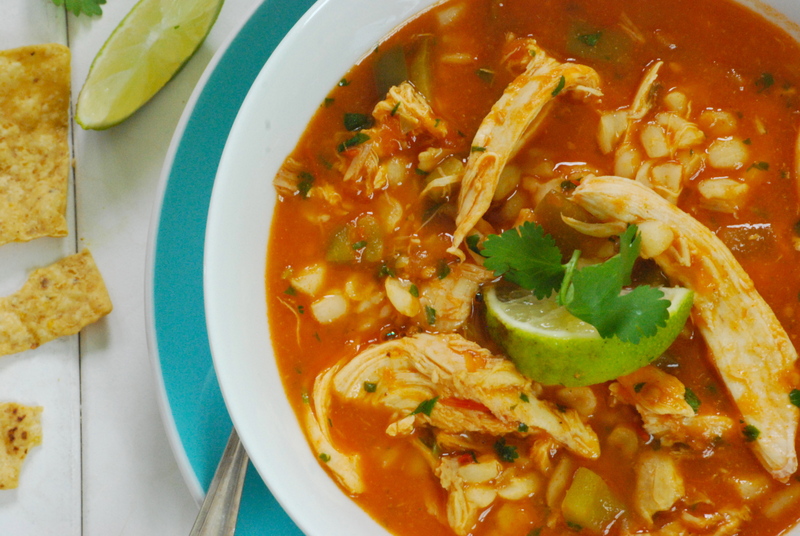 When the soup is done, stir in the lime juice and cilantro. Adjust seasonings, if necessary. Serve with tortilla chips and queso fresco, if desired. Enjoy! What a delightful looking recipe for a cold day. I also reside in St. Paul. Would you mind sharing the market you found the hominy? I’m assuming El Burrito Mercado but perhaps you can verify before making the trip? Thanks so much.